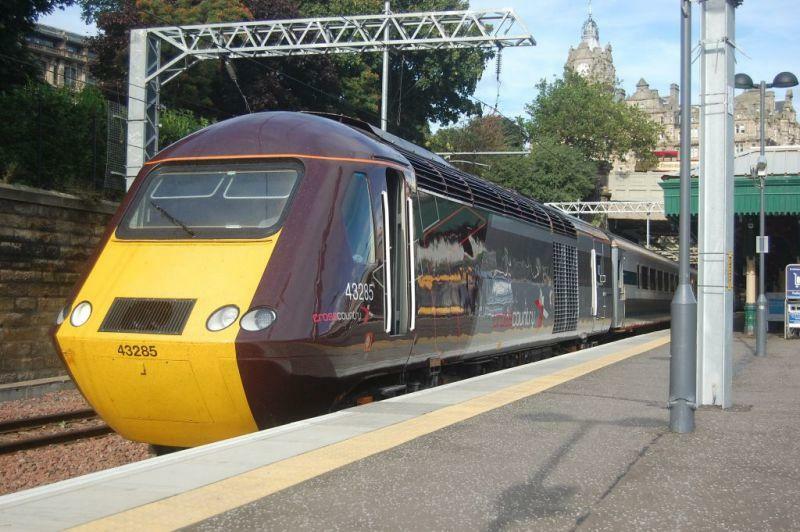 HSTs operate in passenger service in Scotland for Abellio ScotRail, Arriva Cross Country, and LNER. One HST set is also used for Network Rail Infrastructure Monitoring. Abellio ScotRail will receive nine 4-carriage and 17 5-carriage trainsets from 2018 from Great Western Railway for use on longer-distance services between Edinburgh, Glasgow, Aberdeen and Inverness. The first set, which included power cars 43021 and 43132, was delivered to ScotRail on 1st September 2017. The set was transferred to Aberdeen Clayhills on 10th September for the start of driver training. The power cars will be refurbished at Brush Loughborough, while the coaches being refurbished at Wabtec Doncaster. The first refurbished set is due in February 2018, with a full fleet in service by December 2018. Sunday 9th December 2018 saw the launch of the new timetable, and a wider introduction of the fleet's HSTs, now including unrefurbished (branded by Scotrail as 'Classic') ex-First Great Western Mk3 slam-door sets. See HST ScotRail Fleet for formations and numbers. LNER operate a fleet of HSTs along the ECML from London to Edinburgh and Aberdeen or Inverness. LNER have 15 HST sets, and thirty-two Class 43 HST Power Cars. They are based at Edinburgh Craigentinny depot for maintenance. See HST East Coast Fleet for formations and numbers. Between December 2006 and March 2009, the thirty power cars operated by GNER and later NXEC were fitted with MTU engines and renumbered in to 432xx and 433xx series. A further two powercars (from East Midlands Trains) were added to the East Coast fleet in May 2011 and soon re-engined and renumbered. LNER also hire-in powercars from East Midlands Trains. Usually these are only used on servies between Yorksire and London, but sometime find their way to Scotland. Arriva CrossCountry have five HST sets to provide additional capacity to support their fleet of Voyager and Super Voyager DMUs. 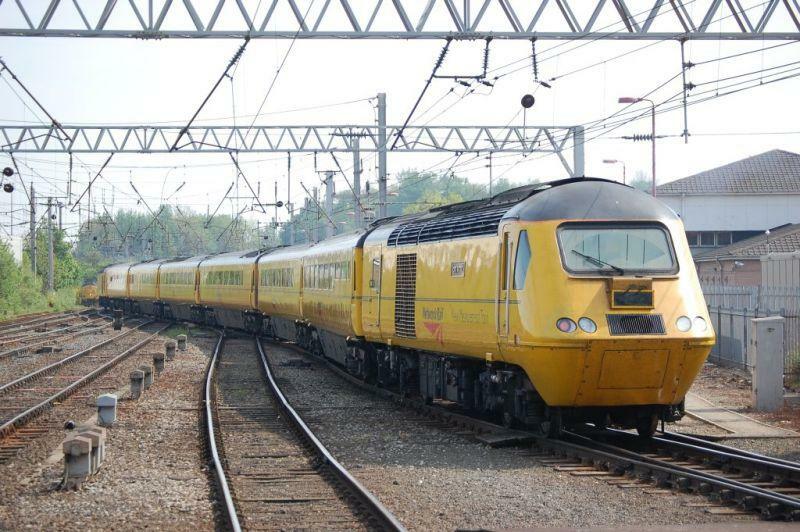 Network Rail have a modified HST set called the New Measurement Train (NMT), which was introduced in June 2003. It is operated on their behalf by Serco and runs on the East Coast and West Coast Main Lines. If the NMT is unavailable, a substitute test train powered by top and tail DRS Class 37s or DBS? Class 67s has been known to run in its place. 40000 975984 NMT Generator Coach Lab 15 "Argus"
Project Hayabusa which is Japanese for Project Falcon, is a partnership between Hitachi and Network Rail to test a battery powered HST power car to see if it could help HST emissions. It would be known as a Battery assisted diesel locomotive after conversion. The power car chosen for this refurb was 43089. The Power car was originally meant to be fitted with an MTU engine but due to demand has kept it's Paxman Valenta. To cut down on weight the rechargable Lithium Ion batteries were put in the TGS coach 977996. After testing on the preserved Great Central Railway in the Summer of 2007, 43089 began use on the NMT, and was first noted in Scotland on 13 November 2007. The 48 Lithium ion rechargable batteries supply the power for moving the train off the mark once a decent speed has been achieved the train diesel engine in this case the Paxman Valenta kicks in to get the train up to linespeed or testing speed. The batteries are then recharged as the train brakes for a station stop or signal check meaning the batteries will always have sufficient power for starting the train away from a station or signal check. The diesel engine can still work if the batteries have been drained of power and have insufficient power to move the train. HST ScotRail Fleet for formations and numbers. HST East Coast Fleet for formations and numbers. Class 43 MTU Renumbering into 432xx and 433xx series. Created by brucekitchener and last modified by Dysgraphyk at 21:56, 28 of February 2019.